Keep in mind that the growth of more than 170 cm will be a little short. Super! The store issued delivery by courier, received almost instantly (23.12-order, 02.01 already delivered). 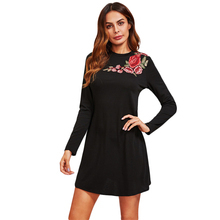 The dress is also happy: material-thin jersey; the size fully matches; sleeves are not short; embroidery looks good; seams, cut processing-everything is fine. The seller will take note and i will order more! Fits small, gave it away. The material is thick and the applique is nice. It's very simple and fine fabric, but it's just fine. I like it. And it's come very soon. I love it! It looks great. Dress fabric is thin. But the dress is beautiful! Промахнулась с длиной. На рост 178 коротко, буду добавлять длину. В целом все как на фото и в описании, качество хорошее, вышивка красивая. Мои размеры 90-67-105 рост 178 как раз. very fast, 7 days tu lithuania. beautiful dress. Good product, arrived to Serbia for 27 days. Ordered size L ( I usually wear L) and it fitted good. It's a little to short, but not too much. It's thin, but all in all very satisfied. быстрая доставка, размер L, подошёл на полный русский М. красиво.